My research and field experience regarding the behavior of short tailed sheep in Baltistan show a high degree of instinct for flocking. These results are a part of the findings in my Ms. Thesis Grazing behavior, habitat use and diet selection on the high pastures in Basho valley Baltistan, submitted at the Department of Animal Science, Agricultural University of Norway, 1999. Baltistan is a region of the Northern Areas of Pakistan, found within a semi-arid and rugged mountainous landscape (Umrani et al., 1989) in the southern part of the Himalayas. Cultivation is limited, especially in the upper part of the valley, which lies within a single-cropping zone, about 3.200 m.a.s.l, and therefore livestock products are essential for the agro-pastoralists. Summer farming is an important and integrated part of the production system, enabling the villagers to utilize the rich high altitude pastures, as seen in many marginal mountain areas worldwide. Parallels are found to the summer farming system practiced in mountainous area of Norway hundred years ago. The farmers keep local breeds of sheep (Ovis aries), and the average number of sheep pr household is estimated to be 8 (BDO, 1998). Several households join together herding their sheep and goats together in groups of 100-200 animals. These groups are herded strictly and guarded all through the day, brought back to the summer farms or villages in the afternoon and kept in enclosures during night. The reason for herding and using the night pens are mainly to protect them from predation carnivores like fox, wolf and snow leopard. So-called "improved breeds" of sheep have been imported from southern parts of Pakistan during the last 2-3 years. This is one of many attempts to improve outcome from husbandry in the region. 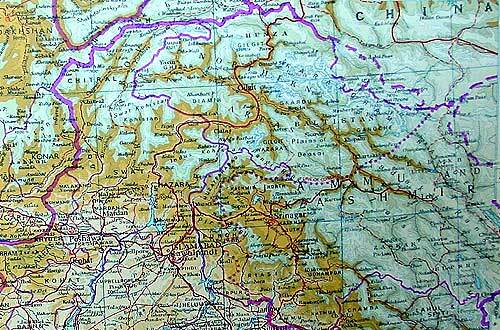 The fieldwork for this study was conducted in Basho valley during July 1998. From a group of animals we randomly selected 6 adult goats and 6 adult sheep, which were individually marked with numbered collars. The animals were owned by 10 households and herded together and of pure local breed. Different aspects of the behavior of the animals were observed and recorded during the entire day during totally 10 days. Scan sampling, which means that a group of subject’s is rapidly scanned at regular intervals and the behavior of each individual at that instant is recorded (Martin, 1993), were used collecting the data. Approximately every 45 min. all the marked individuals within the herd were scanned. The distance to nearest animal of the same specie and the distance to nearest animal of the opposite other species was estimated. At the same time the activity, whether the animals was grazing or laying down, was noted. The statistical analysis procedures were run using Statistical Analysis System (SAS) program, version 6.10 (SAS Institute Inc., 1989). In addition interviews with the local herders and sheep-owners about animal behavior were conducted. The average distance from a sheep to the nearest sheep was 1.2 m (table 1). Sheep stay more close to each other compared to goats while grazing and when lying down. The most extreme result, distance from one sheep to the nearest sheep on 0,1 meter in average (table 1), was found when the sheep lay down. Distance from a goat to the nearest goat was in average 3.6 m (table 1). Table 1. Average distance (m) and standard error (± SE) for average distance, distance while grazing and distance while lying down from sheep and goat specie to the nearest individual of same specie. . The distance from a sheep to the nearest individual of goat was longer during both activities, grazing (6,2 m) and lying down (3,7 m), compared to the distance to nearest sheep (table 2). Table 2. Average distance (m) and standard error (± SE) for average distance, distance while grazing and distance while lying down from sheep and goat specie to the nearest individual of opposite specie. Significant differences (p=0.0001) were found between the average distance from a sheep to the nearest sheep (1,2 m) and sheep distance to the nearest goat (6.9). The local people from several villages’ answered that there was a big differences in behavior between the local sheep-breed and the imported breeds. The imported breeds were described as "good, but difficult to keep because they are not good at climbers and does not mix well with the other animals in the group. They stay together 4-5 in separate groups and are difficult to herd"
The data in this study are based on recordings from not more then 6 individuals of sheep belonging to the same group of animals, and must therefore be considered only as an indicator of instinct for flocking. Still groups of herded sheep, which always stay close and quickly follow if a sheep in front makes a turn, are seen all over Baltistan. The extremely short distance of only 0,1 meter from one sheep to another while lying down are probably highly due to the animals tendency to seek areas in shadow when resting. Because of shortage of such areas they tended to be crowded. Therefore distance while grazing, a activity which always took place in open areas/the sun are a better indicator of instinct for flocking compared to distance while laying down or the average distance. Average distance from a sheep to the nearest while grazing was still not more then 2,4 m.
Sheep tend to stay closer to another sheep compared to stay with a goat. This was found while grazing as well as when lying down, and show that an instinct of flocking in sheep favors staying together with other sheep compared to staying together with the goats. Intensive herding is probably a factor affecting the distance between the individuals of sheep, but since the distance between goats grazing in the same herding group are almost double (4,2 m in average) there must have been room for the sheep to spread out more within the limits the herder give, if wanted. Therefore the instinct for flocking in this breed of sheep seems to still be quite extreme. 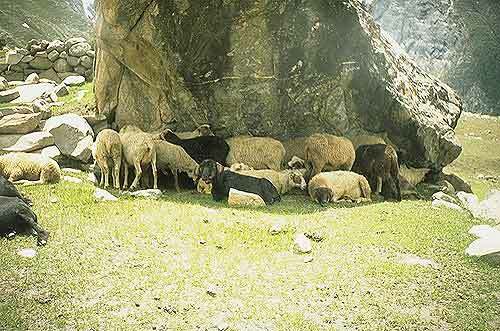 Predation on livestock is common in Baltistan. The strategy of sticking together in groups is a well-known way for each animal to reduce its risk of being predated (Krebs and Davies, 1978). The short tailed sheep breed kept in Baltistan has, as far as known, been kept separated from other breeds of sheep during thousands of years. Therefore the instinct of flocking we see in this sheep-breed most likely have developed as a result of surviving with the always-present risk of being attacked by predators for a long time. Trough interviews with the local people from several villages we found that the farmers are clearly aware of differences in behavior among the sheep. Despite better production the imported breeds were regarded to be less favorable when it came to behavior compared to the local breed. Local breed of sheep and goat seeking shadow during the hottest hour of the day. The average distance from one sheep to the nearest individual while grazing was 2.4 m and this behavior of staying close together indicates a strong instinct of flocking in the local short tailed breed of sheep in Baltistan. The sheep stayed closer together then demanded by the herder and sheep prefer to stay close to other sheep compare to keep close to the goats in the group. The local farmers clearly regarded high instinct for flocking in the sheep as an advantage. Mrs. Veronika Seim graduated from Department ot Animal Science at the Agricultural University of Norway (NHL) in 1999. Her thesis, submitted in partial fulfilment of the degree of Cand. 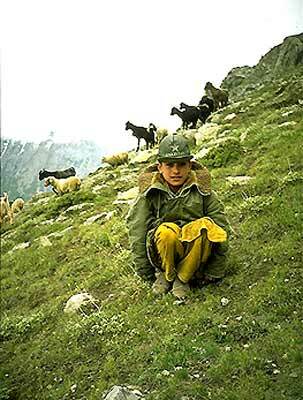 Agric is a study on husbandry and high pastures in Northern Pakistan (written in english). She is now working for three Norwegian farmers organizations at their cooperation project (Landbruk og Rovvilt) regarding the conflict between grazing livestock and predators. Veronika Seim is an invaluable help to Sheep-Isle's English pages.